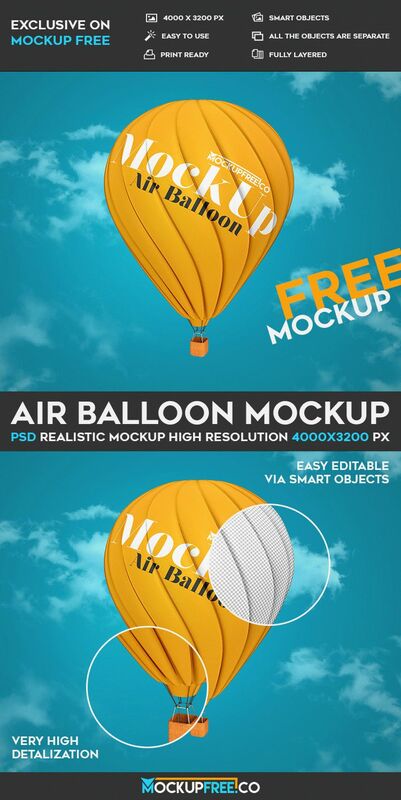 Download our new Freebie – Air Balloon – Free PSD Mockup for your professional aims and for implementing interesting ideas. This Air Baloon Mockup in PSD is very realistic and can be used for different companies, service promotions and creative and modern advertisement. You should know that this free mockup in PSD can be customized without any problems. Open this fully layered file in Photoshop after free downloading and change colors, add the necessary design and of course use the best background and text if needed. After downloading our freebie, you can get the 4000 x 3200 px PSD mockup with smart and separate object and very high detalization. This is high quality mockup PSD fully layered and grouped. It allows you to display your design easily and quickly, sale a lot of time and get some awesome results in future. We hope our work can help you in implementing your aims and professional ideas. Unique and stylish PSD mockup can be very useful for designers, artists and promoters. Download it absolutely free from Mockupfree and enjoy this mockup!